What’s in store is an authentic theatrical ‘discovery’ waiting to be discovered–even better, this new production in Long Beach surely makes it worth discovering! Yes, it can be an emotional, ‘larger-than-life’ rollercoaster ride at times, but it’s one you’ll be thrilled to be taken on. Flying in the face that he’s simply a funny-man (who sometimes plays the banjo,) the libretto Martin has penned is surprisingly poignant, peppered with just a few gag-lines or humorous one-liners to lighten the mood as needed. In fact, one sound you can count on hearing from quite a lot in this one is the effervescent twang of that self-same stringed implement with the long neck that’s been Martin’s instrument of choice since the start of his varied career. What’s more, the entr’acte by the onstage band itself was so uplifting, it could well-nigh be counted as a showstopper in its own right! Brickell’s music and melodies recall the very best of the now near-fabled, pre “Rhinestone Cowboy” days of the “Grand Ol’ Opry” circa the 1930’s up through to the 1950’s–back when country music remained very much entrenched in its Deep-Southern Cultural roots. Her lyrics also possess an incredible wealth of sincere human emotion that runs the gamut from piercing visceral pain and outrageous tragedy to sheer exultation at one’s uttermost desperately yearned for desires at last being realized. Even the hardest moments to watch will continue to have your toes a’tappin’ thanks to the ingenuity of each of her tunes. 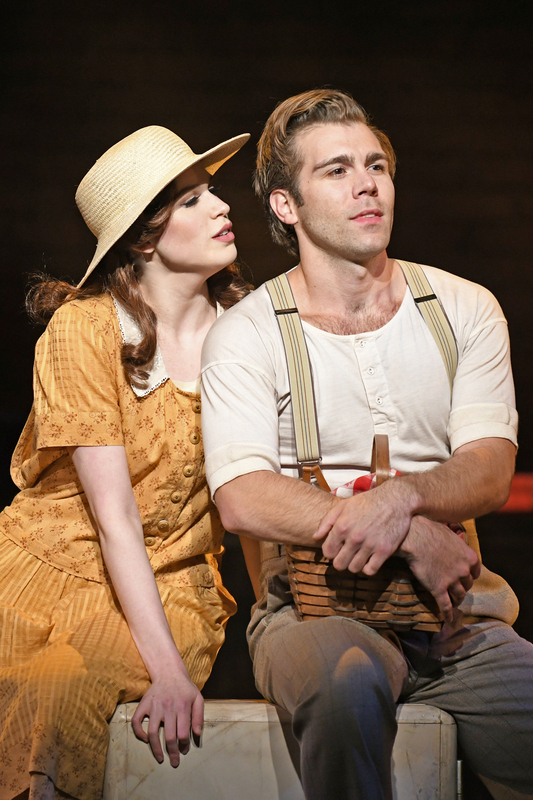 To both Martin and Brickell’s supreme credit, “Bright Star” challenges what a musical can be—and just as vitally, how it can be sung! 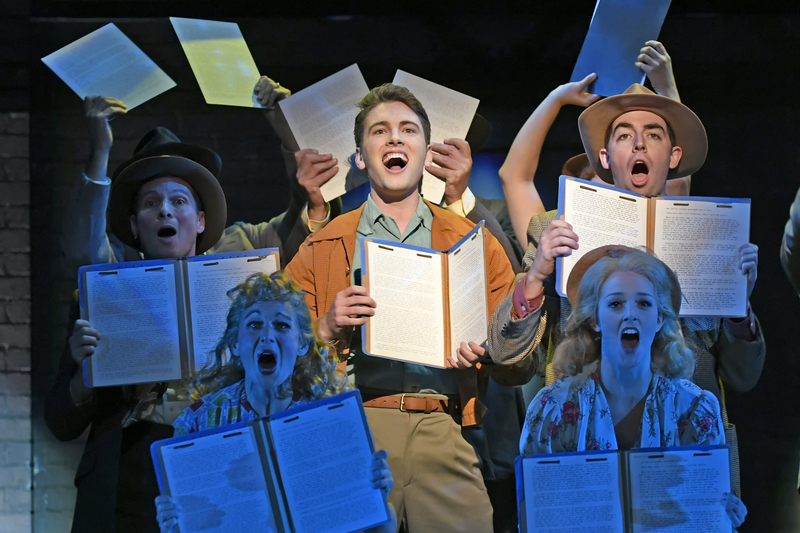 Moreover, “Musical Theatre West’s” new production more than lives up to all the strengths the material is teeming with, and in a few cases, categorically surpasses or enhances them, so that by the time the final bows roll-around you’ll KNOW you’ve been through something! What’s in store is an authentic theatrical ‘discovery’ waiting to be discovered–even better, this new production in Long Beach surely makes it worth discovering! Yes, it can be an emotional, ‘larger-than-life’ rollercoaster ride at times, but it’s one you’ll be thrilled to be taken on. Richard Gatta has undoubtedly put his knowledge and insight of the show to excellent use—maintaining a fast, but not too-hurried pace, which aids immensely in a show like this that occurs in disparate (and in many ways, competing,) time frames, and with so much happening as the plot progresses. His resourceful blocking also gets maximum results from what are ostensibly minimalist sets, creating a vigorous, and always engrossing stage production that absolutely couldn’t be a more buoyant nor more life-affirming choice with which to launch MTW’s brand new season! Likewise, due to some very clever choreography, even the scene changes are energetic and entertaining. 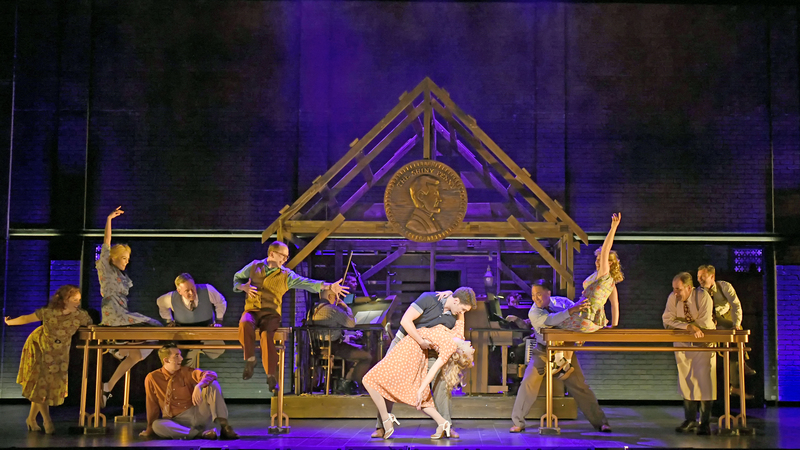 As far as dance goes, Gatta recreates the original moves of Broadway choreographer Josh Rhodes, and while the dance-sections in this instance are not exactly huge extravaganzas, the show does boast its share of fancy footwork which inform both the place and culture the story is played out against—over and above its differing times, besides! 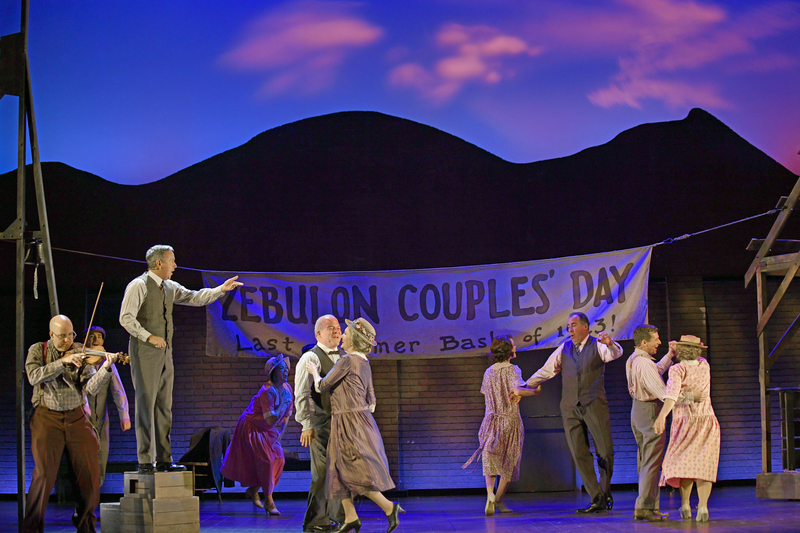 One such sequence involves the “Zebulon Couples Day 1923” celebration, for which Gatta has fashioned a fun and folksy “Square Dance”. He also incorporates some fairly flashy maneuvers into “A Firmer Hand” (look for some jazzy rhythmic ‘ham-bone’ style hand-gestures accentuated with some snappy ‘square-dance calls” here too. For “What Could Be Better” (as our two young protagonists’ romance seriously starts to heat up,) he reconstructs a sultry summer barn-dance, as the couples on the dance-floor, awash in shadowy blue light broken by a solitary handful of dim lanterns—commence to capering in slow motion while the young couple, downstage but somewhat separated from the throng, engage in a smoldering courtship ritual. Afterwards, amidst the lighthearted “Another Round” Gatta uses the opportunity to re-state and reinforce those times even more thoroughly by enlivening the song with a rollicking “Jitter Bug” –to a down-home, Honky-Tonk beat, while even utilizing a few samba-influenced steps into it to boot! 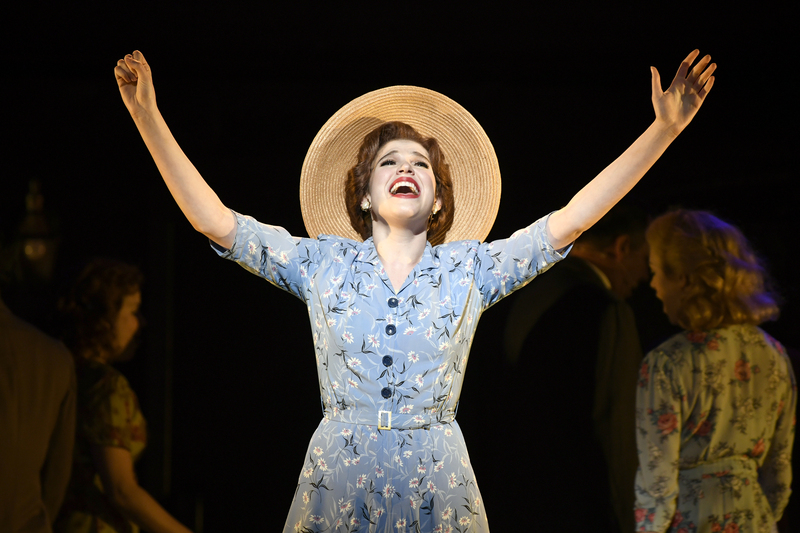 The show’s real heart and soul is the enthralling performance by Anna Mintzer as “Alice Murphy”, who never rings a false note whether acting or singing (–and for this role, both require some fairly robust abilities.) Hers is decidedly a two-fold characterization—alternating between the more mature (and much staider and in control,) Editor of “The Ashville Southern Journal”, and the more carefree young lass who hasn’t yet been ‘scarred’ by life. Later, once “Jimmy-Ray” has re-entered her life, we find Alice has become a changed woman—less guarded and severe, adding one more ‘dimension’ to her character’s arc. With a voice reminiscent of Linda Ronstadt or Crystal Gayle, (with maybe just a touch of Donna Fargo thrown in) this makes her interpretations of the songs she’s been allocated especially impressive and oh, so fitting for the material. This she verifies straight away with her opening, “If You Knew My Story”—acquainting us with the older “Alice” while also giving us some insight as to how (despite her outward solemnity,) she really was, once-upon-a-time, a child with an indomitable life-force, as sings of her younger self, “I Born to carry more than I could hold; even though I stumble, even though I fall, you’ll Never see me crumble—Never see me crawl!” It’s dynamic opening all around. Her follow-up chanson, “Way Back In The Day” hearkens back to the best of what vintage Jukebox country music often was, when the stories they told were every bit as important as the notes and chords used to tell them, as “Alice” further enlightens us as to the girl she once was. Also lending laudable support, albeit in smaller portions are Ted Barton as “Alice’s” father, “Papa Murphy” and Rayna Hickman as “Mama Murphy”. Their prime number, “A Firmer Hand” in which they query of their headstrong daughter, “Is she a black sheep or just a little lost lamb?” is a clear-cut crowd-pleaser, backed by more impressive choral work for the ensemble. Hickman also shines in the Two opener opposite Ms. Mintzer, called “The Sun Is Gonna Shine”. Mellow, and even a little melancholy, in it we learn that “Alice” has suddenly and mysteriously been ‘granted’ a scholarship to go away to college. It’s a strong showcase for both women (even as ‘The Sun’ slowly climbs over the up-stage backdrop, symbolizing “Alice’s” departure from town and from home–ostensibly for good.) David Atkinson also provides admirable support as “Papa Cane”, giving an exceptional rendition of the moving “She’s Gone” (“This news was too big for a letter” he informs his newly-back-from-active-duty, G.I. son of his mother’s recent passing.) 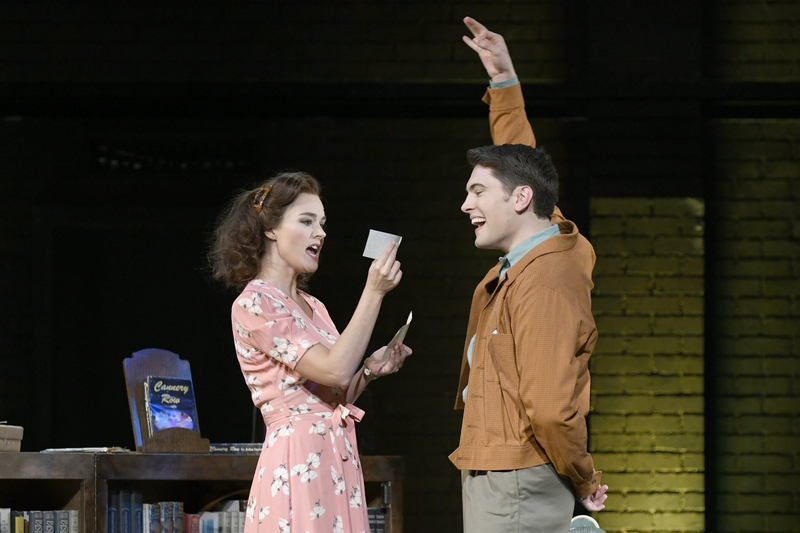 Atkinson’s brilliant acting work with this scene is made all the more so by his impassioned ‘restraint’ with his refrain of the song after which “Billy” joins in making it a stark, but truly powerful duet. So too, Rachelle Rose Clark as “Alice’s” flirtatious Assistant, “Lucy” furnishes her share of hearty laughs and even a bit of excitement as a hot-to-trot ‘cookie’ who knowns how to make the friendly neighborhood dance-hall ‘cook”! She particularly gets her moment to astonish us with “Another Round”, wherein she attempts to help “Billy” loosen up at “The Shiny Penny”. There, she teaches him how to ‘cut a rug’ with some of the latest dance crazes of the age, thanks predominantly to a free-flowing concoction of ‘hair of the dog’ hooch and some prodigious high-kicks. When he eventually joins in, “Billy’s” verses are just as ‘on the beam’ making for a jivey little interlude! 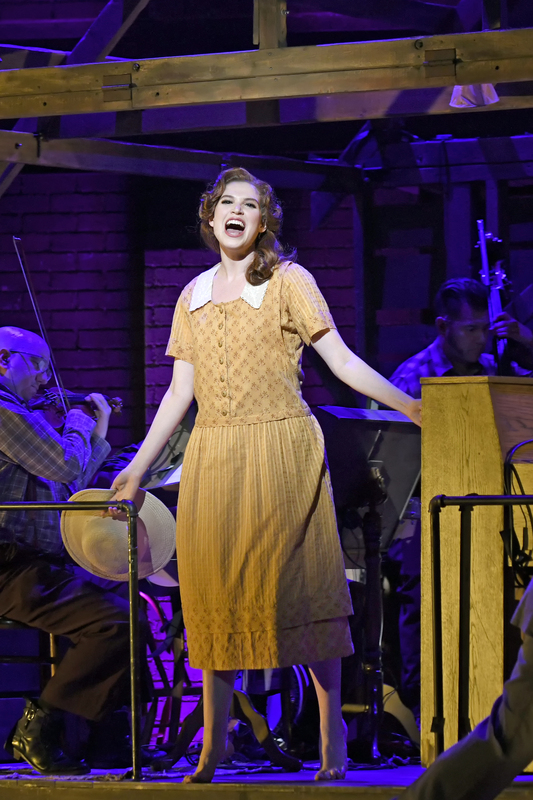 Considering too, how for this show in particular, the fiddle is the Hallmark of the musical accompaniment, invaluable—and unquestionably ovation-worthy, is the stunning fiddle playing by James Saunders. So substantial is his work (mainly in the background but all through the proceedings nonetheless,) that he and his music could even be considered a bona-fide character in-and-of themselves. Situated as he is, he’s almost like the ‘spirit’ of the very atmosphere and rural ambience that underscores the entire story. 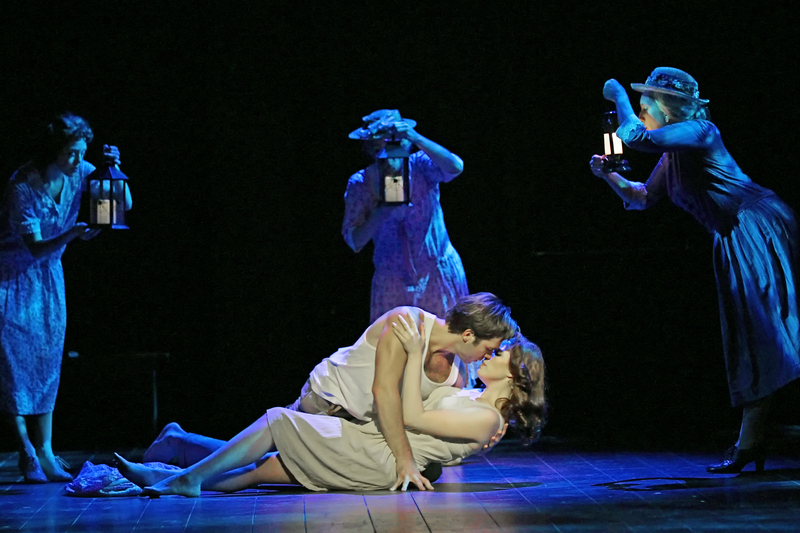 Making this production even worthier of renown, “Musical Theatre West” has obtained the original Broadway sets and costumes. 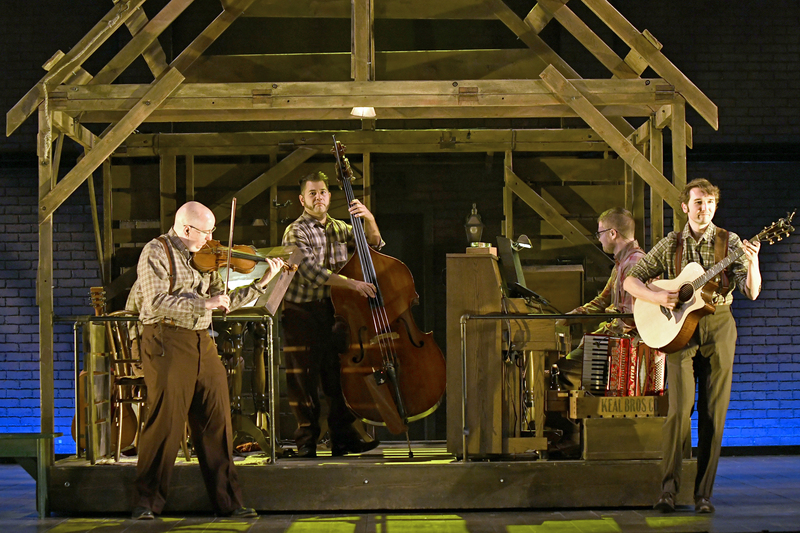 The set, by Tony Award Winning Set designer Eugene Lee (whose past credits include “Wicked”, “Candide” and “Sweeney Todd”,) consists of expansive brick-wall flats and at center stage a movable “shed” until that’s fittingly slapdash and more than a tad ramshackle; this is the spot the on-stage band is stationed. (Of course, there’s also a more expanded orchestra in the pit under the expert baton of Dennis Castellano.) Shrewdly though, doubling as a playing space, it can be turned-around to function as one of several meager dirt-farm houses. Not to be overlooked either, running the length of the stage overhead, is a broad girder, on which a miniature electric train, at various intervals, rolls across, cunningly signifying railway travel or a change of location. Meritorious too, are Jean Yves Tessier’s inventive lighting effects that bathe much of the ‘flashbacks’ or more ‘revelatory’ scenes in turquoise light, also enabling the sun to rise up over the rear-scrim or to blanket it in a mass of twinkling stars. 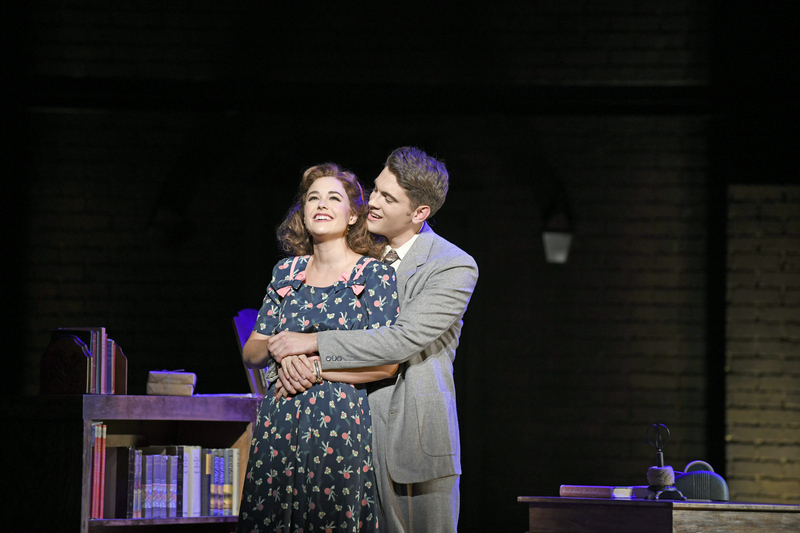 “There’s always a song to sing, a melody in the dark; lifts your spirits every time you hear it, comforts an aching heart”—Sure enough, this is precisely that kind of show! 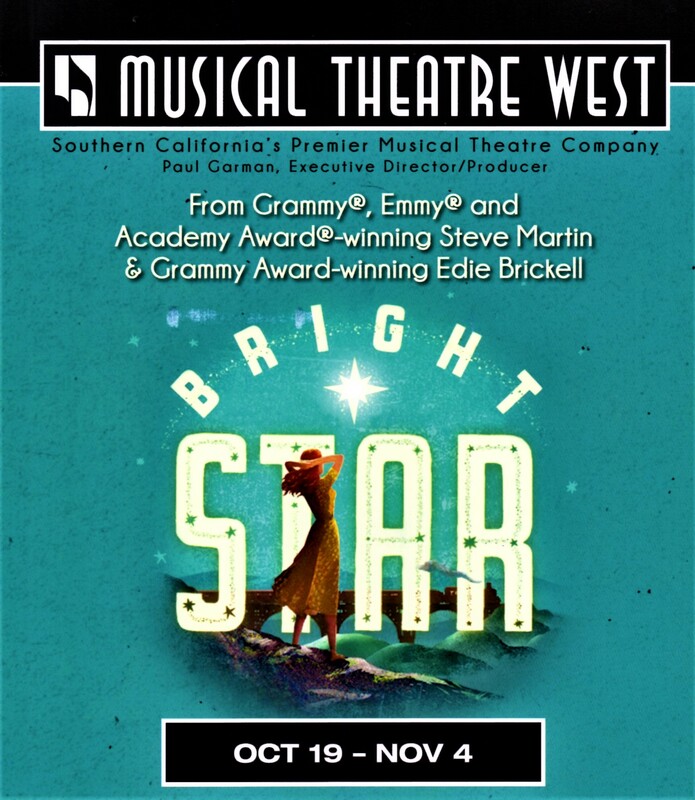 After “Previewing” on Friday, October 19th, “Bright Star” ‘Officially’ opened on Saturday, October 20th, 2018, where it is slated to play through Sunday, November 4th, 2018, at “The Carpenter Center for the Performing Arts” located on the campus of California State Long Beach, 6200 E Atherton Street, in Long Beach, California. Showtimes are Friday and Saturday evenings at 8:00 PM, with Saturday Matinees at 2:00 PM, and Sunday Matinees at 1:00 PM. There will be an added “early” Sunday evening performance on October 28th at 6:00 PM and a Thursday evening performance on November 1st at 8:00 pm. Tickets may be obtained on-line by logging onto: http://www.musical.org, by phone at: (562) 856-1999 ext. 4, or from the “Musical Theatre West” ticket-office located at: 4350 E. 7th Street, Long Beach, Ca. Production Stills By “Caught In The Moment Photography”, Long Beach CA. 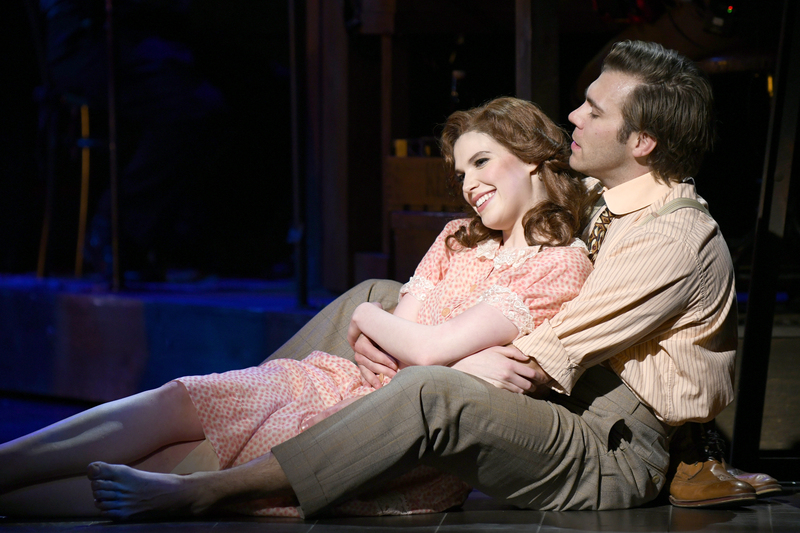 (www.caughtinthemoment.com ) Courtesy Of “Musical Theatre West”; Special Thanks To Paul Garman, Lori Yonan, Richard Gatta, Dennis Castellano, And To The Cast And Crew Of “Musical Theatre West’s” 2018 Production Of “Bright Star” For Making This Story Possible. This entry was posted in Theater reviews and tagged "A Man's Gotta Do", "At Long Last", "Bright Star", "Heartbreaker", "I Can't Wait", "I Had A Vision", "If You Knew My Story", "Love Has Come For You", "The Carpenter Center For The Performing Arts", "The Sun's Gonna Shine", "What Could Be Better", "Whoa Mama", 2016 Drama Desk Award For "Best Musical", 2016 Out Critis Circle Award, 2016 Tony Nominated Musicals, 2018 So Cal Theater Season, Alice Murphy, Asheville NC, Billy Cane, Blue Grass Mountains, Blue Grass Musicals, Carpenter Center For The Performing Arts, Country Western Musicals, Darryl Ames, Dennis Castellano, Edie Brickell, Eugene Lee, Jimmy Ray Dobbs, Long Beach CA, Long Beach California, Long Beach Theaters, Lucy Grant, Margo Crawford, Mayor Dobbs, Mayor Josiah Dobbs, MTW, Musical Theater West, Richard Gatta, Southern California Theaters, Steve Martin, The Asheville Southern Journal, The Legend Of The Iron Mountain Child, World War Two Era Musicals, Zebulon NC. Bookmark the permalink.